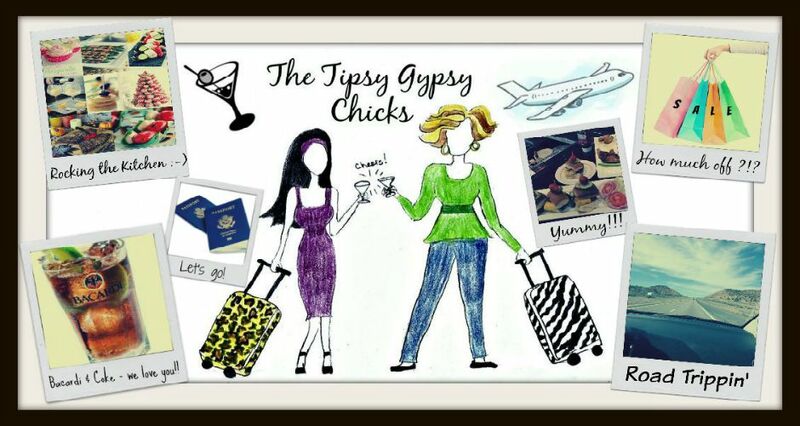 Recipes | The Tipsy Gypsy Chicks: Delicious Dollar Tree Dinner! Kayt had to go to Dollar Tree after school today for some new holiday decorations. She was also low on food at the condo. She didn't feel like going to ANOTHER store, and she wasn't feeling the drive thru or delivery options either. So, she looked around Dollar Tree to see what they had. She found CoraBella Tricolor Cheese Tortellini! We've both been trying to rid our diets of nasty chemicals and the added sugars and salts in processed food, so Kayt checked the label. Happily there were no scary words that require a Ph.D. to pronounce! Kayt also picked up some of the little bags of Jennifer's Garden brand frozen asparagus. When Kayt got home she threw a pot of water on to boil, cooked the CoraBella Tortellini (it actually took about 20 mins, a bit longer than the package promised but no big deal), drained it, and then threw some butter, salt, pepper, garlic podwer, onion powder, dried basil, and parmesan cheese into the pot and mixed it all up. Meanwhile, she'd put the asparagus spears in the microwave for 3 minutes. This was a guess on her part since there weren't microwave instructions on the bag. It was FAR TOO LONG, next time she'll try 2 mins and see how that goes. But the bottom line is Kayt made a DELICIOUS, quick, easy, and fairly healthy dinner for about $2! And she actually had about half of the tortellini leftover! Who knew the Dollar Tree was such an amazing resource for good food?!? Kayt is totally going back and stocking up ASAP, and she's gonna see what else they have that sounds good and isn't processed beyond the point of actually being food. 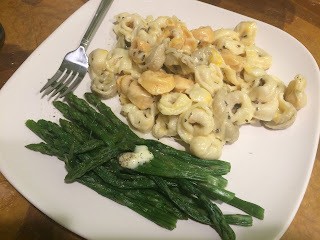 One bag of frozen asparagus, and half the package of tortellini.